Veteran Congress leader in Meghalaya and five-time chief minister of the state, Donwa Dethwelson Lapang on Thursday quit the Congress, the party he had been associated with for over 40 years. 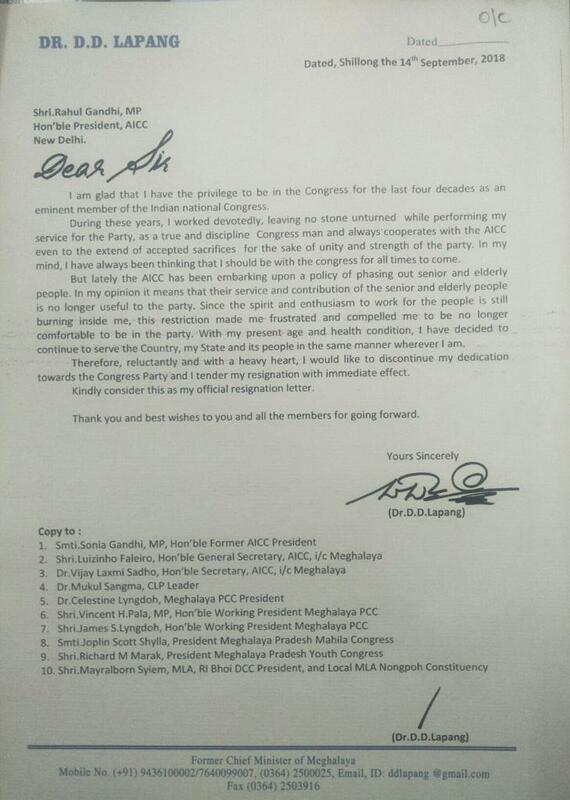 In a resignation letter submitted to AICC president Rahul Gandhi which was also sent to media houses in Shillong on Thursday evening, Lapang said lately the AICC has been embarking upon a policy of phasing out senior and elderly people. “In my opinion, it means that their (senior and elderly party leaders) service and contribution are no longer useful to the party. Since the spirit and enthusiasm to work for the people are still burning inside me, this restriction frustrated and compelled me to be no longer comfortable to be in the party. With my present age and health condition, I have decided to continue serving the people of the country, my state and its people in the same manner wherever I am. 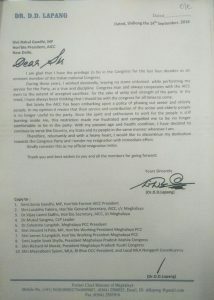 Therefore, reluctantly and with my heavy heart, I would discontinue my dedication towards the Congress party and I tender my resignation with immediate effect,” Lapang said in his letter to Gandhi. Lapang who lost the Assembly elections only once in 1993, had represented as MLA of Nongpoh Assembly constituency from 1972 to 2018. He was the president of the Meghalaya Pradesh Congress Committee and took oath as the chief minister of the state five times.